paul gregutt's washington wine blog – unfined & unfiltered: who got the flintstone? we got the flintstone! who got the flintstone? we got the flintstone! 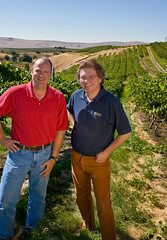 Many years ago, at a tasting of new releases from an Oregon pinot producer, a bottle of riesling was offered as a curiosity. At the time it was more than a decade old, perhaps as much as 15 years past its release date. It had originally sold for $3 or $4 (yes, it was that long ago). And it drank beautifully. It was then that I learned that riesling, as much or more than any other variety grown in the Northwest, can age almost indefinitely. PG: This new program gives consumers the opportunity to taste for themselves what I experienced at a sit-down vertical about three years ago. At that time, I sat in on a blending trial with the two winemakers, and after we finished, we opened several older vintages of Eroica as well. A short time later, I tasted through every vintage of the Single Berry Select. On both occasions, the older bottles were expressive, evolved, and better by far (in terms of complexity) than the new releases. Does it age well in the bottle, too?